Contraception evoked during at least 1 of the medical consultations, recommended and prescribed after the procedure. Parents (or guardians) attending and parents’ (or guardians’) signature for abortion confirmation required for minors under 16. Mandatory post-abortion consultation 1 week after the abortion procedure. All health care professionnals (HCPs) have the right to conscientiously object. Physicians can refuse to perform surgical abortion due to their Catholic beliefs. Abortion is reimbursed to resident women when performed due to medical reasons only. 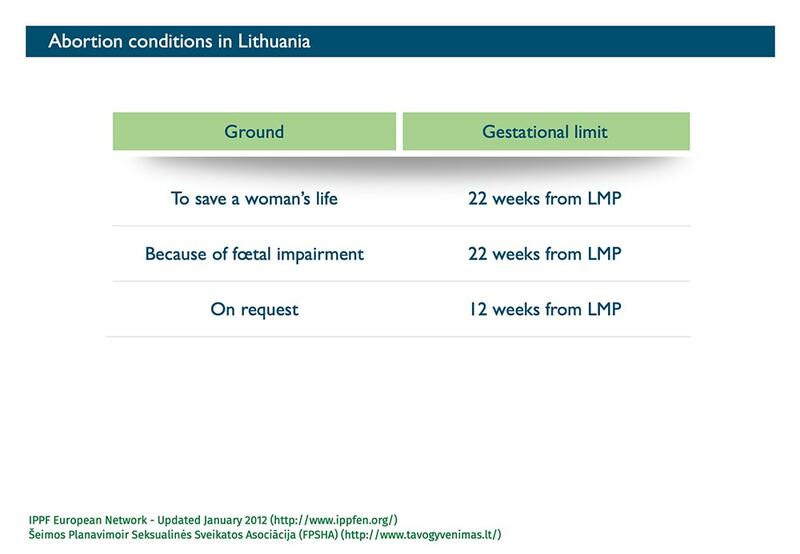 – Resident women have to pay around 250 € for surgical abortion “on request”. – Non-resident women have to pay around 500 € for surgical abortion. We thank Dr. Lina CIAPLINSKIENE for her help in data collection.